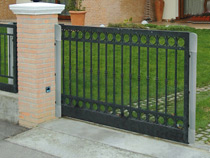 Your correctly installed electric gate will give you many years of reliable, secure and safe operation. Automated gates by their very nature do however pose a potential risk. To ensure your property and family are safe, Approved Installers fit automatic gates to all the relevant UK and European laws, including the machine directives and Part-P electrical safety rules. To help make your gate as safe as possible all CAME equipment undergoes exhaustive final testing within the company and by outside testing agencies. CAME products are guaranteed to meet the current European safety standards and the company has been certified ISO 9001:2000 and ISO 14001. Making your gate safe involves a combination of elements; correct installation, correct wiring, installing integrated safety systems and comprehensive testing. Your Approved Installer will be able to advise you on the safety features you require depending on your situation. CAME active infra-red safety beams are invisible to the naked eye, but can be transmitted from a transmitter up to 18 metres in outdoor conditions to a receiver. These represent an excellent form of positive “beam” protection around the gateway and on wing type gates they are normally installed in two sets, one just in front of the gate line and one just inside the arc-line of travel described by the swinging wing of each gate. In this way, a safety zone will have been created, so that on the automatically timed closure of the electric gates, if a vehicle is still within the area of travel of the gates, it will prohibit the gates closing and furthermore, if a “beam” should be broken after the automatic closing has begun, it will re-open and hold the gateway open until the obstruction is clear. DF safety edges are soft profile sections of collapsible ABS material that can help to protect the leading edges of opening gates. When the DF comes into contact with an obstruction, it triggers the gates to stop or reverse their operation, so the object or person who was within the gates movement is safe and undamaged or unhurt! DF is sensitive along its entire length, to protect against contact with any obstacle, large or small. The exclusive patented system makes it possible for the entire edge to warp, sideways and front ways, to ensure reverse movement at the slightest contact. The size of the edge and its warping structure accurately detects the obstacle. An additional guarantee against blows and crushing. Particularly useful for sliding gates and in situation where pets or children could get into the gate movement area and avoid the safety beams. The DF can be combined with a system of wireless connections, eliminating complicated and unsightly wiring. Buried under your driveway, induction loops are made up of a roughly rectangular shaped wire loop, laid repeatedly around the rectangle to create a coil. A miniature magnetic induction field is created above, so that when a metallic vehicle passes over this magnetic induction field, its presence is detected. 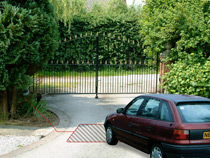 This can then be used to trigger the gate to open, or can be used as an additional safety device to prevent the gates from closing on your vehicle. When used as a switching device, induction loops are usually installed on busy, accessible gateways to allow freedom of vehicle movement without the need to push any sort of button. 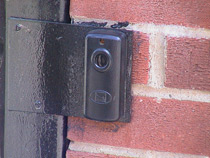 As a result, they are usually used to trigger the gates from inside the property.